Wineries in Istria are awesome. If I remember them correctly. You know that a visit to the winery typically includes lots of wine-tasting. Wine-tasting could potentially affect my, otherwise good, judgement (you have been warned!). However from what I believe I have experienced on my visits to these wineries in Istria, I put them at the top of my list of wineries in Istria worth a visit. Istria is really a lovely region. And I am very happy to call it a home. One of the strange affaires I've had here is my complete shift from red to white wines. Istrian signiture wine is a white grape variety, called Istarska Malvazija. And I am totally crazy about this wine. Bear in mind that this is the wine to taste on your visit to any Istrian winery, even if you are not into white wines. Authentic, fresh, and light, this is a flagship wine that you simply cannot ignore if you visit any of the wineries in Istria. I don't even know where to start when it comes to Kozlovic winery. Beautiful architecture, friendly staff (thanks, Marko! ), fixed working hours (not always the case, thus we've learnt to appreciate this fact), and fabulous wines. Oh, I've almost forgot to mention the location! Kozlovic Winery is located close to Momjan, well off the beaten path, surrounded by olive groves, and beautiful landscapes. Combine a visit to the winery with a lunch at Stari podrum restaurant, and you'll set yourself for a great day. This is another gorgeous winery to visit in the vicinity of Momjan. The property is nice, a traditional stone building featuring wine cellar, a retail area, tasting room, and even a small museum dedicated to wine and wine making process. Surrounded by gorgeous landscapes, it makes for an excellent vantage point. On a clear day you can see, not only the Adriatic sea, but also the Alps. The particularity of Kabola Winery is that they use “amphorae” for fermenting the wine. These are actually the large terra cota pots buried underground. Very interesting winery to visit! Cuj is one of our favorite winemakers in Istria. He is passionate, hard-working and wine-loving man. 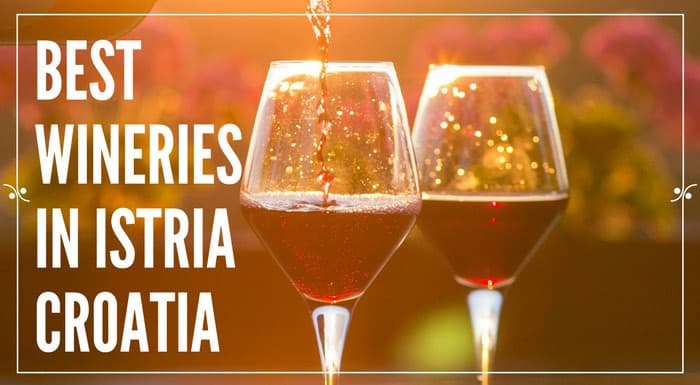 Visit to his winery is a great experience, and he and his family will make you feel very welcome and at ease while sharing with you their family's history of wine-making and viticulture. Cuj also produces four extra virgin olive oils. His property is nice, and consists of an oil mill, wine cellar, and a tasting room with an open fireplace. Bruno Trapan is a rock'n'roll star of wine making in Istria. He's so cool that we've been almost intimidated visiting his winery and meeting him (OK, we're exaggerating, but we were pleased to meet him). Like we've met Mick Jagger for real. Just better :). He belongs to the younger generation of wine makers. He's charismatic, and fun to be around. Very active on social media, there is almost no wine blogger or wine journalist who comes to Istria and doesn't visit Trapan Winery in Sisan near Pula. His winery is modern. The tasting room, decorated in dark brown wood, features a large tasting table and a nice fireplace. Great winery to visit if you are in Istria. Roxanich is a living proof that the wine can be made in many ways. This guy doesn't buy a story of young, fresh, and light whites. Instead, his wines are orange, an aged white wines full of character. (Oh, I really love his Ines u bijelom wine). The winery is located in a small village, only 10 minutes drive from Porec (Yay, one of the best and located so close to home!). Since Roxanich takes a different approach, ages his wines, and leaves a must in conntact with skin for up to 180 days, you can have an excellent vertical tasting of the same wine. This is a great way to witness first hand how the wine actually develops through different stages. Do you like to visit a winery? Is there any winery anywhere in the world you would recommend us to visit? Can you recommend a wine tour company to take us from Rovinj for a day tasting the Istrian wines?? We are keen to discover some fabulous wines and are travelling in October. Tnx to Frank and all of the people that like us and our wines and helps us in the promotion of our beautifull region! Thanks for stopping by, Bruno! We think that you guys do great job. We are just trying to spread a word. You had me at wine. Just one more reason I need to get myself to Croatia. Virginia has a long wine history (Thomas Jefferson started some vineyards) but has really just taken off in the last decade. They do a great job with cabernet franc and viogner. Do you know that Virginia was a first state I’ve visited within the USA?! So, it has a very special place in my heart. And now you tell me that the wine making took really off in the last decade – it’s even closer to my heart :). here in Croatia, wine history is actually very similar. We’ve been making wines since the ancient time, but in the last two decades it really took off. And now you can find very good wines here. I think the winery (never mind the wine) would have affected my judgement as well! Thanks for these suggestions. I’ll have to bookmark this page for whenever I make it to Croatia. How blessed you are to live in Istria!! Like you, I’m a fan of reds, so I’d be curious to taste the white wines from this region. Thanks for sharing. Hi Dana, thanks for stopping by. We really feel blessed to live here. Let us know when you decide to visit and we’ll be happy to show you around. I’m always amazed at the stylish architecture at wineries. You always think they’ll be old and…old! But there’s been great innovation in the industry. Great picks. So true, Eilen! Very stylish architecture. The industry is definitely taking a new direction. The wineries are really stylish, and here they do tend to mix the new and modern with some elements of old. I’ve only had the pleasure of going to some smaller wineries in Traverse City, Michigan, US but really enjoyed what we were tasting. I’d love to do some of those in Istria and have those gorgeous views to go along with them! I’ve been to Napa Valley and it was great. So many wineries there that I visited. Oh, Napa Valley is on my wishlist like forever. Would love to visit one day! Great tips for visiting Croatia! I’m heading to Paso Robles, CA next week to explore some wineries and can hardly wait. It’s interesting to learn about the different grapes varieties used from each area like the Istarska Malvazija you speak here. Great photo of the tractor in the vineyard! We love visiting wineries so we’d feel so at home with these wineries in Istria. Although, these look more charming than the ones we have here in Southern CAlifornia. I have never heard of orange wines and it sounds so interesting. Thanks, Mary. Wineries are really an integral part of Istrian tourist offer. And I think everybody would enjoy the visit (even if it’s only for the landscapes). I’ve never been in South California, but would sure love to go. I have to admit that I have never been to a winery (I know, I know, I am ashamed!) which is especially shameful to admit since Hrvatsko Zagorje is another Croatian region full of them! Hubby and I plan on visiting some wineries though, maybe we will stop by Istria and see if they can persuade me as well to switch from red to white wine! Ana Lynn, nothing to be ashamed of, but definitely an experience you should have asap :). Let us know how you like Zagorje Wineries. We’ve never explored this area much. Just been to couple of Klet and to Kumrovec. If in Istria, give us a call, and we can visit a winery together. I love the color orange. I am sure seeing an orange wine was pretty cool. We went to the wineries in Tuscany. My favorite part was the wine tasting with the special cheeses and homemade plum jam. Such a neat treat! The color is really intriguing. Oh, you are so right. The better part of wine tasting is that it comes with homemade treats. Here they usually serve cheese, prosciutto, and olive oil. Bob, you crack me up! Do you know when exactly you’ll be here. We still want to take you for a lunch. I have never visited a winery since my husband doesn’t drink. Maybe I should still go and let him be the designated driver. A visit to Roxanich sound really interesting in that I’ve never heard of orange colored wine. The vertical tasting sounds like it’d be a good education. Yay to wineries! I’m definitely up for visiting some 🙂 I really enjoyed the wine region in BC when I visited last summer. Hopefully I’ll go again this year. Fun experience, isn’t it?! What grape varieties do they have in BC? I love visiting wineries! And I love to do so whenever possible! We have some wonderful wineries in our region – Niagara wineries in Ontario, Canada. It is most famous for its ice wines. You’ll have to try them sometime! I would love to try Croatian wines, too! Hmmmm vino! Ja puno volim vino. Wish these were were just little closer to us here in Zadar. Must get back your way after summer. I had some delicious wine last summer in Croatia and of course can’t remember any names except the one I posted to Instagram which I loved. It was quite a deep yellow and not a pale white. It was called Posip Cara (with a hook on the S and C – can’t do that on my keyboard). Do you know this one? I’d love to visit these wineries one day. Looks lovely. I’ve tried a bit of Croatian wine the last few years and I’ve really enjoyed it. Now I just need to find some of it outside Croatia as well! Oh this is awesome ~ I was just telling my hubby that I really wanted to a trip to CA USA wine country, because I miss it and now I read this! SO I told him we could here instead of flying back to the USA awesome very interesting! I had no idea there were wineries in Croatia! I would really enjoy a clear afternoon at Kabola winery – can’t beat mountain, sea and countryside views in one. Love how they still use the earthenware vessels to make their product. Getting married in a winery sounds like a great idea! Oh, if you enjoyed the cycling holiday in France, you might enjoy it in Istria as well. Istria is a big cycling destination in Croatia, and you can find these wine & bike tours. Let us know if you decide to visit and we can help with the suggestions. I’ve never actually visited a winery. Must rectify that soon….and these look great! The process looks really interesting (and obviously tasting the results is fun too…..;)). Did you say wineries? Mmm! Must.come.back.to.Croatia. I remember the small vinyards of Korcula and absolutely loving all the lovely locals wines. I still have to visit Korcula vineyards. been only to the town of Korcula so far. Glad that you’ve like them, Esther!